Missoni launched its first, stand-alone men’s swimwear collection for the S/S 2016 season during its runway show on May 21, 2015 in Milan. This collection avails to the chevron stripe, greco stripe, color and graphics — Missoni icons— to present essential, total looks ideal for both the beach and the city. Printed swim-trunks have been fabricated in short, mid-length and board-short cuts and realized in a variation of multicolored chevrons and floral motifs carried over from the Men’s S/S 2016 main collection. Pure cotton t-shirts demonstrate a visual play of graphic prints which include a degrad? chevron, tone-on-tone Missoni logo, floral motifs and a space-dye effect set on melange fabrics. A hooded, nylon windbreaker, perfect for the summer chill, has been created in a variety of prints and solid colors which reveal a mini zig-zag pattern. Printed, reversible, nylon, shoulder bags—versatile and stylish—have been produced in a variety of colors and patterns. 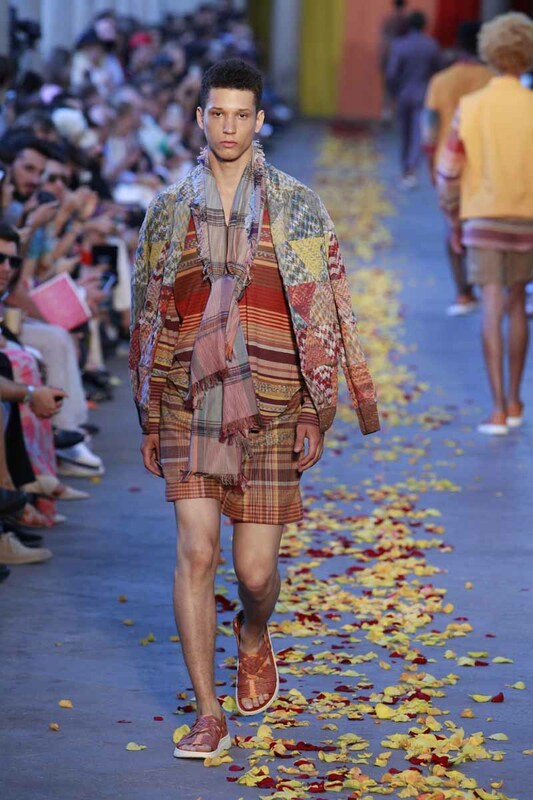 Missoni’s eponymous knitwear completes this collection with degrad?, pima cotton t-shirts, polos and hooded pullovers created in a soft, toweling effect. Malibu Sandals, the Southern California footwear maker, has exclusively created a braided, hand-woven, slip-on sandal out of eco-friendly materials that impeccably completes the looks proposed in this inaugural swimwear collection.